The separatists on Thursday asked people to observe a shutdown and march towards the office of United Nations Military Observer Group in India and Pakistan at Sonwar. 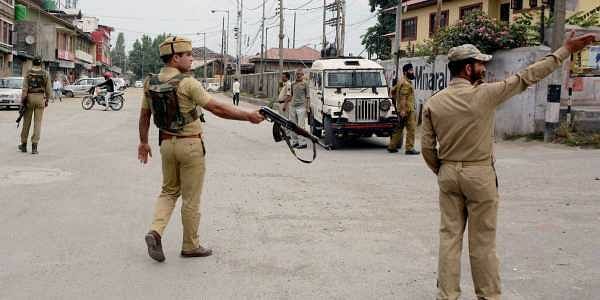 SRINAGAR: Authorities today imposed restrictions in parts of Srinagar to maintain law and order in view of a strike and a march to the local office of the United Nations called by separatists. Restrictions have been imposed in nine police station areas of Srinagar, a police official said. He said while strict restrictions under Section 144 CrPc have been imposed in Safakadal, Nowhatta, Rainawari, Khanyar, M R Gunj and Maisuma police station areas of the city, partial curbs were in force in Kothibagh, Kralkhud and Ram Munshi Bagh areas. The curbs have been imposed as a precautionary measure to maintain law and order, the official said. The separatists on Thursday asked people to observe a shutdown and march towards the office of United Nations Military Observer Group in India and Pakistan (UNMOGIP) at Sonwar here to protest alleged rights violations. "On 10 December, the International Human Rights Day, Kashmiris will observe a complete shut down and blackout against gross human rights violations," the separatists, under the banner of Joint Resistance Leadership (JRL), had said in a statement. The JRL, comprising Syed Ali Shah Geelani, Mirwaiz Umar Farooq and Mohammad Yasin Malik, said a protest rally towards UN observersÂ’ office at Srinagar would also be taken out from Lal Chowk on the same day. Normal life elsewhere in the valley was disrupted due to the strike. Most of the shops, fuel stations and other business establishments were shut across the valley and public transport was sparse, the official said. He, however, said private cars, cabs and auto-rickshaws were seen plying in the areas where there were no restrictions.